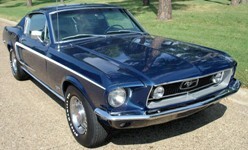 The 1968 Mustang GT was a special options package that could be added to any Mustang with the 302 or 390ci V8 engines. The package contained grille mounted fog lights, dual exhaust, a new body side C-stripe, heavy duty suspension, 14 inch GT steel styled wheels, a new GT gas cap, and newly styled GT quarter panel emblems. The GT Reflective Group option was available which changed the side stripes to a reflective material and added reflective paint to the steel styled wheels. This beautiful Presidential Blue 1968 Mustang GT/CS with a 289ci V8 was our Attitude Of The Week for April 5th, 2009. Arlie says that this was a 2008 Christmas present to myself. Only 155 California Specials built with 289 & 4-speed. Still has the original 8-track player and smog equipment. Arlie also has a Gulfstream Aqua 1968 GT/CS which was our Attitude Of The Week for 6-15-08 and December of our 2009 calendar. Candy Apple Red Mustang GT/CS with 230 hp (302 cubic inch) 4 barrel, V8 engine. The CS stands for California Special which included a Shelby style decklid with a spoiler, sequential taillights, and a blacked-out grille with out Mustang identification. The GT was also missing from the normal GT wheelcovers. A similar option package was available in Colorado called the High Country Special. Seafoam Green 1968 Mustang GT hardtop owned by Dave. Dave comments, "The car was restored in 2000. I purchased it in 2005. It is a 'J' code Mustang with the 302 4-BBL engine with C-4 transmission. It is the original color Seafoam Green. The interior was changed to black when it was restored - the original was Ivy Green. The most interesting story is that I found the build sheet behind the dash when I was replacing bulbs in the instrument cluster and it confirmed everything that was on the car." Acapulco Blue 1968 Mustang GT with the second largest engine offered in a 1968 Mustang, 325 hp (at 4800 rpm), 390 cubic inch, V8 with a Holley 4 barrel carburetor. Meadowlark Yellow 1968 Mustang GT fastback with a rebuilt S-code, 390ci, V8 engine and aftermarket wheels. The door data tag of this car reads: 63A 2+2 fastback with standard interior, W Meadowlark Yellow exterior paint, 2A black crinkle vinyl and black kiwi vinyl standard interior, 18U assembled on July 18th, 1968, 53 ordered in the Kansas City area, 7 with a 3.25:1 conventional rear axle, and U C6 automatic transmission. This 1968 California Special Mustang GT is owned by Amy Moores of Washington and is our Attitude Of The Week for the week starting May 15th, 2011. We photographed Amy's car at the 2011 Spring Mustang and Cougar car show sponsored by the North Olympic Mustangs and Cougar club in Port Angeles, Washington. Also check out the Ford designed GT/CS newspaper advertisement we just found looking though tons of newspapers. 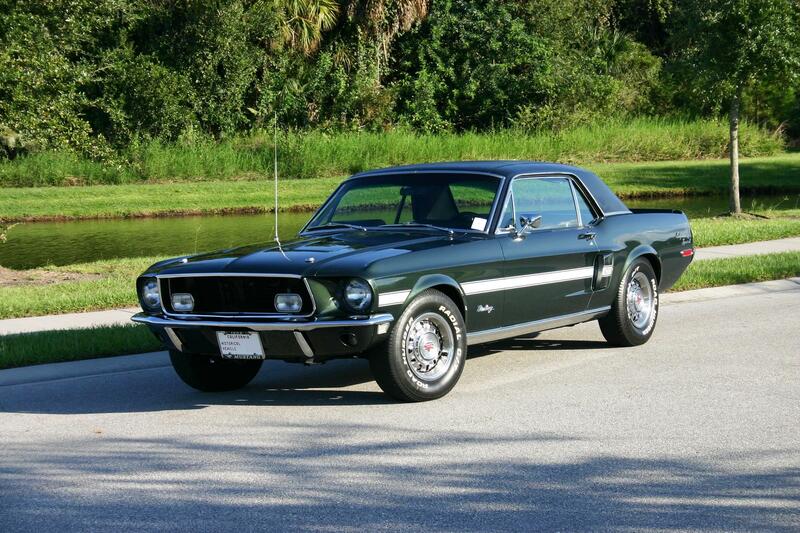 This is a Highland Green 1968 Mustang California Special hardtop. They are also called GT/CS cars. Steve McQueen drove a Highland Green 1968 Mustang GT fastback in the movie Bullitt. This one is an original code-R Highland Green Mustang, with code 2A black interior, date code 29C March 29th 1968 build, ordered by code-71 Los Angeles district, code-2 rear end with 2.79 gears, and a code-W C-4 automatic. Check out this blue 1968 Mustang GT hardtop owned by Shaunn Fullmer from El Dorado Hills, California. This is our featured, Attitude Of The Week for the week starting September 11, 2011. Shaunn shares, "An original CA Black Plate Car. San Jose plant built and has not left NorCal since. Third owner with 65K original miles. Mild mods to engine include ceramic headers, Flowmaster exhaust, Edlebrock intake and carb, MSD wires, braided hoses, and Pertronix coil and igniter. She's a blast!" Restored Acapulco Blue 1968 Mustang GT fastback with a deluxe (luxury) interior and a 325hp (at 4800rpm), 390 cubic inch, 4 barrel, V8 engine. Sunlit Gold 1968 Mustang GT hardtop owned by Boris Mirkin from Lindenhurst, New York. This is a nice looking straight Mustang that has a black interior and all the GT options. Highland Green 1968 GT California Special hardtop with Argent style GT wheels, black vinyl top, metal rocker panel trim, fog lamps, side scoops, GT/CS side stripe and graphics, and an emblem-less front grille. This photo is available in two wallpaper sizes; 1024-768 wallpaper and 2400-1600 wallpaper. Brittany Blue 1968 Mustang GT California Special white vinyl hardtop with all the GT options of fog lamps, grille emblem delete, GT Argent styled steel wheels, hood pins, louvered hood; and the California special options of a GTCS side stripe and rear fender lettering. This car has its original 289 cubic inch V8 engine. A beautiful Candy Apple Red 1968 Mustang GT/CS hardtop with black vinyl roof, argent styled steel GT wheels, Lucas fog lamps with covers, GT/CS side stripe, side scoop, hood pins, metal rocker panel trim, hood vents, and passenger side mirror. Acapulco Blue 1968 Mustang GT/CS hardtop with argent styled steel GT wheels, white GT/CS side stripe and lettering, California Special rear letters, metal rocker panel trim, and aftermarket vented hood. Candyapple Red 1968 Mustang GT California Special convertible owned by Hannes Streng from Germany. This is our featured Attitude Of The Week for the week starting April 26, 2015. Hannes adds, "This is one of the very few 1968 California Special convertibles; it's in condition 2 (which is also quite rare to find). I bought it for my son Fritz - it will be his first vehicle." Acapulco Blue 1968 Mustang GT/CS hardtop with Argent styled steel non-GT wheels, fog lamps, white GT/CS side stripe and lettering, California Special rear letters, metal rocker panel trim, vented hood, blue vinyl interior, and a 289ci V8 engine. Wimbledon White 1968 Mustang GT/CS hardtop with argent styled steel wheels, black GT/CS side stripe and lettering, California Special rear letters, metal rocker panel trim, vented hood, hood pins, and a 195hp (at 4600rpm), 289 cubic inch, 2 barrel, V8 engine. Candy Apple Red 1968 Mustang GT California Special owned by John Roller from Hooksett, New Hampshire. This GT has it's original J-code 302ci 4bbl V8 engine and an automatic transmission. It still wears its original and unrestored paint. It has it's original interior and drivetrain. The engine bay has been repainted in some areas. It was a one owner car till 2010 with 41K miles. John has the original dealer invoice and paperwork. Brought to you first by MustangAttitude.com, this is the top part of a great newspaper advertisement we found for the 1968 California Special GT Mustang. Click on the second and third photo from this set to see the rest of the ad. It was placed by Galpin Ford on March 22nd, 1968 in the Van Nuys News of Van Nuys, California. Wimbledon White 1968 Mustang GTCS hardtop with standard Argent styled wheels; metal rocker panel trim; black GTCS side stripe; Shelby styled side scoop, hood pins, hood louvers, fog lamps, and rear wing; and a 289 cubic inch, 2 barrel, V8, originally rated at 195hp (at 4600rpm). 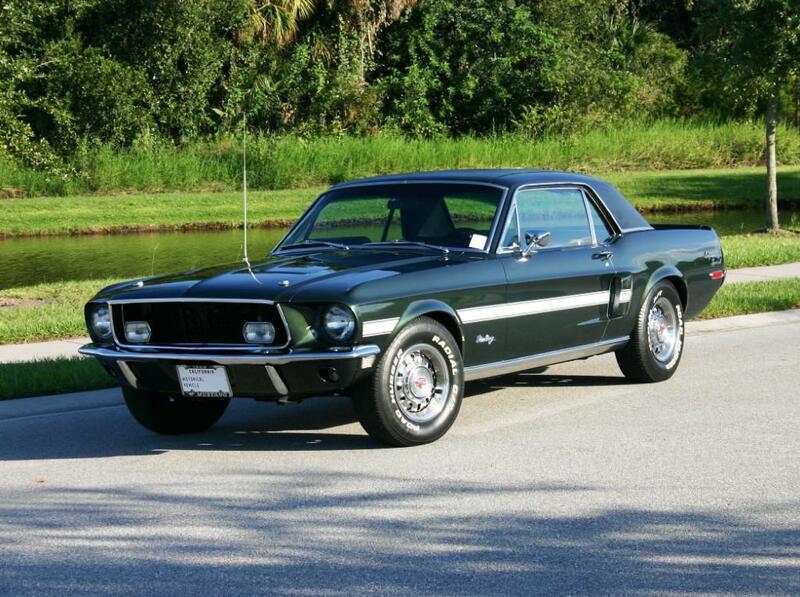 An incredible Seafoam Green 1968 Mustang GTCS hardtop with white side stripes; Argent styled steel wheels with GT hub caps; Shelby side scoops, rear wing, and fog lamps; louvered hood with integrated turn signals (facing the driver); and a 289ci, 2 valve, V8 engine. Only Mustang makes it happen! This Mustang magazine advertisement shows what happens to you after you buy a Candyapple Red 1968 Mustang GT fastback. The advertisement reads, Sidney spent Sundays seashelling at the seashore. Then Sidney started digging the '68 Mustang - the great original. Dug the models: hardtop, fastback and convertible. Liked the low price, too, which left Sidney lots of clams to design his own Mustang, Sidney style. Now Sidney's making waves all over. Last week he saved 3 bathing beauties. (And they all could swim better than Sidney!). Check out another version of this ad. Take a look at this red 1968 Mustang GT fastback. It has the GT fog lights, reflective C-stripe on the side, and aluminum GT wheels. This Acapulco Blue 1968 Mustang GTCS hardtop was at the 2010 Mustang car show in Port Angeles, Washington. The 1968 California Special has the same rear taillight panels and spoiler as the Shelby, fiberglass side scoops, stripes, blacked out grille, fog lights, and hood locks. This Raven Black 1968 California Special hardtop was at the 2010 Mustang Roundup car show in Bellevue, Washington. It has the standard 12 slot argent styled wheels, white side stripe, side scoops with GT/CS graphics, California Special rear fender graphic, rear wing, and 289ci V8 engine. The C-code 289ci V8 was the most common engine for the 1968 GT/CS but others ordered included the T (200ci), J (302ci), X (290ci), S (390ci), and the R (428ci) code engines. Side stripes came in white, black, red, or metallic blue depending on the main exterior color. Most of the grilles included Lucas fog lamps but some did receive lamps manufactured by Marchal. 2.79:1 was the most common rear axle ratio but others included the 2.75:1, 3.00:1, 3.20:1, 3.23:1, and the 3.50:1. The GT California Special was a California special promotion but only about 8 percent of the cars was ordered with the GT option which included dual exhaust with quad exhaust tips, argent slotted steel wheels with GT center caps, and heavy duty front and rear spring. All other standard 1968 GT options were not used. Gulfstream Aqua 1968 Mustang GT black vinyl hardtop at the 2010 Mustang car show in Port Angeles, Washington. This Acapulco Blue 1968 Mustang GT California Special hardtop was at the 2010 Mustang Roundup car show in Bellevue, Washington. Over 1000 Mustangs showed up for the event. This car was parked in the California Special section which included the classic 1968 and 2007+ versions. This Meadowlark Yellow 1968 GT California Special Mustang hardtop was a the 2010 Mustang Roundup car show in Bellevue, Washington. This GT/CS has GT style wheels and a 289ci V8 engine. This Royal Maroon 1968 Mustang GT California Special was at the 2010 Mustang Club of America Grand Nationals in Bellevue, Washington. This GT/CS has the optional GT style wheels, Lucas fog lamps, and a 302ci V8 under the hood. This Lime Gold 1968 Mustang GT California Special with black vinyl roof was at the 2010 Mustang Roundup car show held in Bellevue, Washington. This GT/CS was ordered with the GT option which included dual exhaust with quad exhaust tips, argent slotted steel wheels with GT center caps, and heavy duty front and rear spring. All other standard 1968 GT options were not used including the GT gas cap which probably could be ordered separately. This custom 1968 California Special Mustang GT was at the 2010 Mustang Roundup car show in Bellevue, Washington. This GT/CS was originally ordered Wimbledon White with a black vinyl top, but now wears a bright yellow exterior paint, custom wheels, and custom engine. Meadowlark Yellow 1968 Mustang GT/CS hardtop with black vinyl roof at the 2011 Mustang Roundup car show held in Bellevue, Washington. California Special features include argent styled steel GT wheels, black GT/CS side stripe and lettering, California Special rear letters, metal rocker panel trim, louvered hood with hood pins, and Shelby style rear spoiler/wing and side scoops. Cool Ford promotional photo of a Candyapple Red 1968 Mustang GT fastaback with Argent style GT wheels, fog lamps, side c-stripe, GT fender emblem, louvered hood, and metal rocker panel trim and wheel lip molding.